So far so good – that’s Irish trainer Ken Condon’s assessment of his Championships contender Success Days as the horse prepares to travel to Sydney next week. Success Days holds a nomination for the Group 1 $4m Longines Queen Elizabeth Stakes (2000m) on April 14 and a likely clash with Winx awaits. That’s something Condon said he’s not afraid of and he admits to being a fan of the champion mare. “I’ve been following her, like everybody else. She was very impressive at her last start, she looks as good as ever,’’ Condon said on Sky Sports Radio. 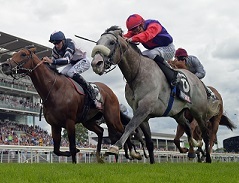 Success Days has entered quarantine at Newmarket and Condon said the grey has settled in well. He’ll have a couple of serious gallops before he steps on the plane next Thursday (UK time). He’s due to arrive in Sydney on Golden Slipper Day and head to the Canterbury Quarantine Centre. Currently there are three horses stationed at Canterbury - Chris Waller's Japanese imports Admire Winner and Satono Rasen and Darren Weir's Japanese sprinter Ittetsu. “The horse seems to have settled in well to a routine pretty quickly,’’ he said. “He’s eating well and drinking and doing all the things you need them to be doing. The form guide says Success Days was well beaten at his last two starts but they were in the Champion Stakes at Ascot and the Irish Champion Stakes. His previous efforts were a win in the Group 2 York Stakes (2000m) and a game second to Johannes Vermeer in the Group 3 International Stakes (2000m) at the Curragh on July 2. “It was encouraging to (Johannes Vermeer) transfer his form to Melbourne. He has some good form and I was happy to see that Endless Drama has won down there too,’’ Condon said. It’s likely that an Australian jockey will be given the job of partnering the six-year-old but Condon said nothing will be confirmed until at least next week. Success Days is a $26 chance with TAB in the Queen Elizabeth with Winx at $1.20. Check out the nominations for the Championships Day 1 here and Day 2 here.